Modular Pouch: 1000 Denier Cordura Nylon. 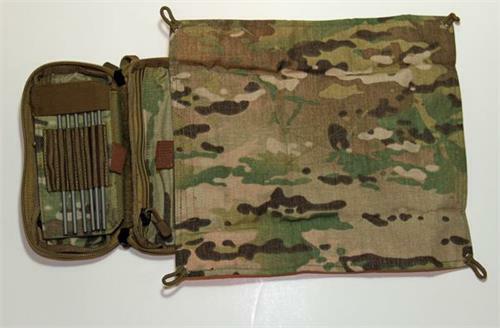 This pouch features a removable cleaning mat, removable rod section “pages” to change or add different caliber rod sections, elastic bands on reverse of page to hold solvent bottles, and two interior zippered pockets for easy storage of tools and accessories. Each pouch may be entirely re-configured to a general purpose pouch or admin pouch (with accessory inserts). Available in Coyote Brown and MultiCam. 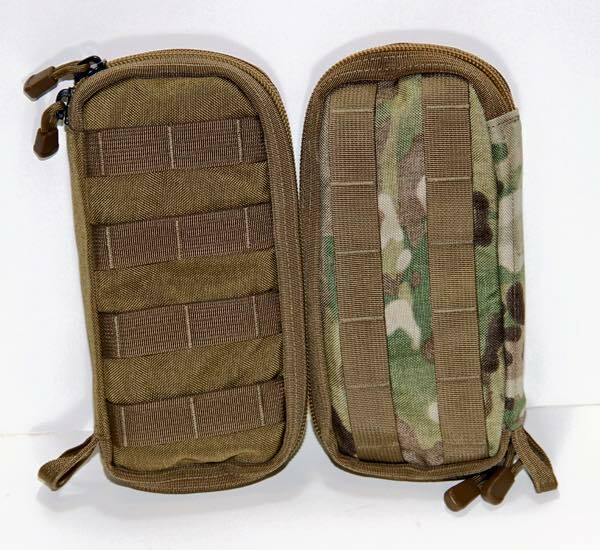 MOLLE attachments horizontal and vertical (MALICE clips not included). Rod Sections for the 5.56 Kit are 17-4PH Stainless steel. The rods are extremely strong and precision manufactured. NOTE: 5.56 sections do not have bore riders due to small bore diameter. Uses standard, commercial (COTS) 8-32 male bore attachments. Picatinny Rail Interface (Patented): 6061 aluminum. Allows the rod to spin freely, forms a conventional T-handle, and also allows the weapon fore grip to be used as a handle. Also equipped with a 3/8” drive socket attachment which may be used as a weapons maintenance tool. Orange cleaning mats are no longer available. Cleaning mats come in Coyote Brown and MultiCam. Read the review by Recoil Magazine.